Home » First World War » War Diaries – First World War » War Diary, 2/18th London Regiment – May 1918. 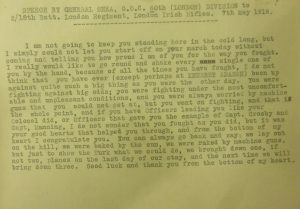 War Diary, 2/18th London Regiment – May 1918. C Coy (Capt JS Crosby) attacked at dawn against lower slopes of Bileibil. Held up by machine gun fire and point blank mountain gun fire from El Haud. D Coy (Capt E Manning) rushed some sangars about P11 central and captured 1 officer and 8 ORs. Remainder of day spent maintaining position. A Coy captured small hill about P11d. Further advance not possible owing to deep wadis and heavy frontal and enfilade fire. No further advance during day. 180th MGC sections doing excellent work covering fire and sniping ranges 800-2000 yards. Heaviest saa expenditure since commencement of operations (Bttn and 1 section MGC use 60,000 rounds). Inter Company reliefs carried out. Otherwise day not eventful. Very hot and short of water in forward companies. Four enemy aeroplanes machine gunned C Coy. Several casualties. One machine brought down by Vickers gunfire. Fell in C Coy’s lines. Pilot (German) killed. Machine smashed too badly to be of further use. 2/20th London Regiment took over the line. Bttn moved to withdraw covered by the 2/20th at 2100 hr a company at a time concentrating again within the Ghoraniyeh Bridgehead about 0200 hrs 5/5/18. At 0315 hrs, marched from Ghoraniyeh to vicinity of Tel es Sultan where bttn rested until 1215 hrs when again moved onto Anzac Dump south of Jericho. Motor lorries loaded and conveyed to old camp near hairpin bend on Nablus road on northern outskirts of Jerusalem. Bivouacked here. Weather – raining. Transport to come later by road. Stayed in bivouac all day. Most day – raining. Men resting only as badly needed. Transport arrived about 1500 hrs. Marched to Ram Allah. Weather cold and dry. Road good for marching. Prior to start, address to Bttn by Major General Shea. Started at 0715 hrs. Arrived 1130 hrs. Camp already standing. Took over from details of 2/21st London Regiment. Map reference of camp about U21b17. Short account of recent operations written by Lt-Col AE Norton DSCO Commanding attached. Amplification of entries for 1-5 May 1918. Copies of Order No 94 and 95 regarding the operations are also attached. Bttn employed on camp sanitary and cleaning work. As much rest as possible allowed to all ranks. The Battalion, a part of 60th Division, is in Corps Reserve. Not more than 1 hour work to be done daily until 13th when training will recommence. As for 9/5/18. Transport inspected by Major EN French, Lincolnshire Regiment who had been attached to this bttn as second in command during Major AH Crabbe’s absence in hospital. Condition of transport – bad. As for 9/5/18. Lieut Col AE Norton DO proceeded on leave to Egypt leaving Major EN French in command. Brigade held Sport near Lake Balua. Battalion in same camp as for 9/5/18. Four hours training per day. Same as for 17/5/18. Battalion sports. Major General Shea and Brigadier General Da Costa present. Same as for 17/5/18 except that no training was done. Eight hours work on road carried out. Moved to vicinity of Beitin (V6 central). Intent – work on “Home Counties” road to be carried out. Lt Col AE Norton DSO returned from short leave in Egypt. The bttn was informed by Brigadier General Watson that it was about to be disbanded and used as reinforcements. Farewell dinner by officers for CO who received instructions to proceed to 54th Division to command 1/10th London Regiment. Farewell dinner by the sergeants to Lieut General Norton DSO. Several cases of malignant malaria which proved fatal have occurred lately due, according to the Medical Authorities, to a long stay in the Jordan valley. Until further notice, the battalion will be under the direct orders of BGC 159 Infantry Brigade, 53rd Division. No work on roads. Battalion still in same camp. Lieut Col AE Norton SO relinquished command of this battalion. Work on road works under RE 0600 hrs to 1000 hrs. Lieut Col AE Norton DSO left the battalion en route for 1/10th London Regiment at 1200 hrs. Major EN French, Lincolnshire Regiment assumed command of the battalion. Bttn relieved 1/7th Cheshire Regiment in left sub sector reserve. Bttn moved from old company area at 0630 hrs. Relief was completed at 1247 hrs. Position of companies as follows: Bttn HQ and C and Coys at L7c. A Coy at L1d82. B Coy at L7d79. Copy No 10 Order No 97 attached. 0800 hrs to 1200 hrs: companies engaged in clearing and cleaning camp and camouflaging bivouacs and tents. 2300 hrs to 0300 hrs 1/6/18: A and C Coys, and B and D Coys working for 1/4th Welsh Regiment and 1/5th Welsh Regiment respectively.